Lead nurturing, simply put, is the building of relationships with individuals who are not currently ready to buy, could be an ideal customer in the future. Its goal is to educate the prospect, build their awareness of your organization and its products, and build trust, making it more likely that the client will choose you when it is time to buy. Lead nurturing is like trying to date the perfect catch. He or she isn't going to commit to based just on a first impression alone. They're in demand. They want to weight their options and they'll need more convincing before going with you. So, why do so many businesses go in for the final sale right off the bat? Earning the business of high-caliber clients takes time, but far too many businesses are short-sighted and don't know how to play the long-game. Flashy web design and a friendly social media presence alone don't impress modern consumers. They expect those things -- it's the bare minimum. Consumers have heard every line and seen every clever presentation. They have to keep their guard up to prevent themselves from getting scammed or wasting their time and they're looking for substance. Before working or buying from any company, they need to know that their best interests are being kept in mind. They need assurance that you're reliable and that you can continually provide value. The relationship needs to be nurtured. I pulled some marketing statistics from HubSpot and Protocol 80, Inc. that paint a clearer picture of how valuable lead nurturing is for businesses. MarketingSherpa states that 65% of B2B marketers have NOT established lead nurturing. Gleanster reports that using lead nurturing showed that 15-20% of the "not yet ready to purchase" opportunities converted into sales. Gleanster reports that 74% of top-performing companies use automated lead nurturing. Now, inbound-driven organizations often place so much emphasis on generating leads, they neglect the processes of following up, but lead nurturing fills that gap. It helps move them through the buyer's journey towards becoming a customer. At SuperOffice, they break leads down into two categories -- marketing leads and sales leads. As mentioned above, the goal of lead nurturing is to build up a relationship with a lead before pushing a sale onto them. It’s important to note that these leads are still looking into information and doing research. Here are 8 best practices to develop an effective lead nurturing campaign. Your lead nurturing email campaigns should be personal. Tailoring each email to the interests and behavior or even name and demographics of your leads and prospects, makes it resonate that much more. Your emails should never appear automated or like a mass "blast." Think outside the box. Consider addressing your emails from various departments in your organization, such as a member of your sales team, your founder, or a department that will help you close a sale. Personalized emails are extremely helpful towards the end of a leads sales cycle. "Several research studies indicate that email marketing continues to be the most effective tactic for lead nurturing. The research also consistently shows that personalized emails tend to produce significantly better results than generic email blasts. In fact, a recent study by Experian indicated that personalized emails can generate up to six times higher revenue per email than non-personalized campaigns do (Source: Experian Email Marketing Study). As highlighted in this helpful blog post, there are all kinds of ways you can personalize your emails to improve your lead nurturing strategy. You can send triggered emails when someone downloads your gated content, clicks on links in your emails, visits certain pages on your website, or when they demonstrate a high level of engagement. When you combine the power of marketing personalization with behavioral triggered emails you can deliver the right marketing messages to the right people, at exactly the right times." One of the most crucial steps in closing the sales cycle is educating your prospects and giving them the information they need in their current state of the buyer's journey. If you only send one lead nurturing email, this should be your main objective. In the Awareness phase: Include blog articles related to leads, interests, Provide them with latest trends and industry statistics. In the Consideration phase: Invite them to a webinar about your product, perhaps a demo. In the Decision phase: Share customer success stories, product reviews. Not sure what type of content or information you should be sending your prospects? Ask yourself; what did they already download, what pages do they visit the most, what are they talking about on social media sites, and have you identified any of their pain points? Compare this information to past prospects to develop hypotheses on what they need to do or know next if they were moving towards a purchase. You'll also want to include offers in your lead nurturing emails. When you do, you provide prospects the opportunity to reconvert and tell you more about themselves. A sure-fire way to have your leads immediately unsubscribing is by emailing them every day. Set up an optimal lead nurturing email schedule that not only keeps your company in the mind of your prospect but gives them time to digest the information. You've gotten the jist by now. Every lead is different and likely in a different stage of their buyer's journey. With this in mind, there is no way you can effectively nurture ALL of your leads with the same email. Grouping contacts by this information helps ensure that the information you deliver is more relevant to them and in turn, more likely to earn their attention and click. 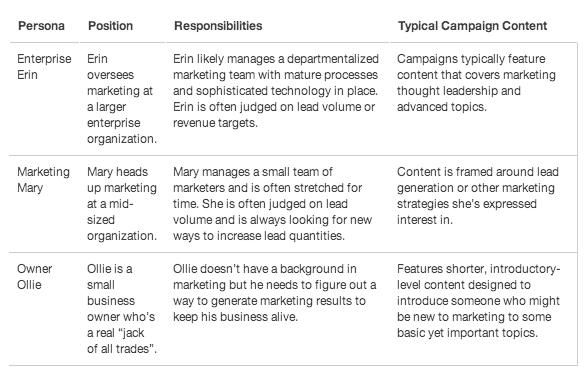 HubSpot then combines these personas with the prospects lifecycle stage--where they are in the buying cycle. Here’s an example of how they nurture leads for the Marketing Mary persona after they know this type of prospect is considering a purchase. Are you finding that your leads aren't opening your emails as often or aren't responding to your sales calls? Try re-engaging them with email marketing. Jeffrey Russo is a Product Marketing Manager at HubSpot once explained that lead nurturing doesn’t have to wait until a prospect has expressed purchase intent. You can start nurturing individuals as soon as they express interest in any part of your business, even if it’s just your blog content. HubSpot, for example, starts the lead nurturing process as soon as someone subscribes to their blog. After someone subscribes, the company sends a steady stream of content providing useful information (such as tips for expanding their blog’s reach) with a brief introduction to their product and an offer to learn more. Once someone requests more information on their product, this campaign stops and they’re opted into a more targeted, product-focused campaign. By engaging early on and providing useful content, HubSpot is able to convert subscribers into leads and then nurture them along the sales cycle. Given how the Web has empowered buyers, marketers have to shift away from self-centered content and provide information that’s useful to their buyers. Russo shared that one campaign that accomplished this for HubSpot was "The Marketer’s Guide to Salesforce," helping those looking to learn more about the software. The eBook broke down Salesforce terminology, explained data objects (e.g., account, campaign, event), how a typical Salesforce environment worked, as well as the methodology and best practices behind topics like lead scoring, sales, and marketing alignment and ROI tracking -- while subtly introducing HubSpot. It was downloaded more than 8,000 times and helped HubSpot close many new customers who may have originally gone with Salesforce. It’s important to personalize your marketing messages outside of email as well. You don’t want show every website visitor the same static and generic message that may or may not apply to them. One way to personalize marketing messages on your website is to use dynamic calls-to-action (or Smart CTAs). HubSpot, for instance, uses these to keep from prompting leads to sign up for a newsletter they’re already subscribed to, or invite a current user to learn more about their software. Before you worry about lead scoring, it's a good idea to decide if lead scoring is right for your business. According to HubSpot, lead scoring is a waste of time for some businesses. Is my sales team getting enough leads to begin with? 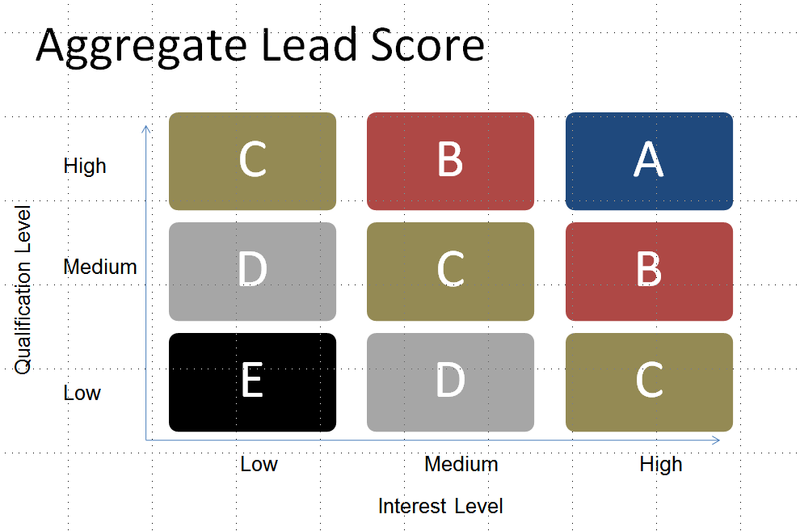 Until your sales team is getting overwhelmed with leads, there's no need for lead scoring. Focus on getting more leads first, then worry about scoring those leads later. Is my sales team even calling the leads they do get? Your sales team might be complaining about how they only get bad leads, so it makes sense to assume a lead scoring program would solve this. The more likely situation is that your sales and Marketing teams are not on the same page. If your company doesn't have a service level agreement (SLA) established between your sales and Marketing teams to clarify how many leads Marketing must deliver to sales and how many sales must follow up with, you should take the time to create one before you even think about lead scoring. Have I gathered enough data to start lead scoring? Before you can implement a lead scoring system, you have to gather two types of data: demographic information captured from your conversion form and behavioral data (lead intelligence) gathered from the analytics software you're using. If you can answer yes to those three questions, your business could benefit from a lead scoring system. Is the lead a good fit for your business? Sometimes it just isn't meant to be. There's no amount of nurturing you can do to force a lead to convert if the fit isn't right. This is why your Marketing efforts should always revolve around your ideal buyer persona -- that way you are doing your best to only attract leads that are a good fit. Demographics -- The lead's job title, annual salary, location, years of experience, etc. Firmographics -- Their company’s name, size, location, annual revenue, etc. Budget, Authority, Need, Time (BANT) -- Can the lead afford you? Are they a key decision-maker in their organization? Do they have a need for your product or service? What's their time frame for implementation? You'll be able to gather most of this information through forms, email subscriptions, and a quick Google search. Just because the lead is a good fit, doesn't mean they are interested. It could be that a competitor is already serving them or maybe they're just interested in your free content, but not a premium service. Email analytics -- What's their open rate and click-through rate? Do they ever respond to email newsletters? Did they join your list by signing up to receive an eBook or watch a seminar -- if so, which ones? Website analytics -- How much time do they spend on your website? Do they leave comments on your blog? Do they visit valuable pages (pricing page, sales page, etc)? Social media engagement -- Do they follow your brand on social media? Do they ever share your content? Do they engage with your social media profiles? Leads that aren't interested shouldn't be ignored completely. Some just need to be nurtured more and yes, some will never buy. However, that doesn't mean they won't refer someone else to your business based on the positive experience that they have in your funnel. Based on the lead's fit, interest, and behavior you can assign a value to each of the qualities and behaviors. The easiest way is to assign a numerical value (positive of negative) to each behavior and then establish a minimum score that leads must earn before your sales team contacts them. 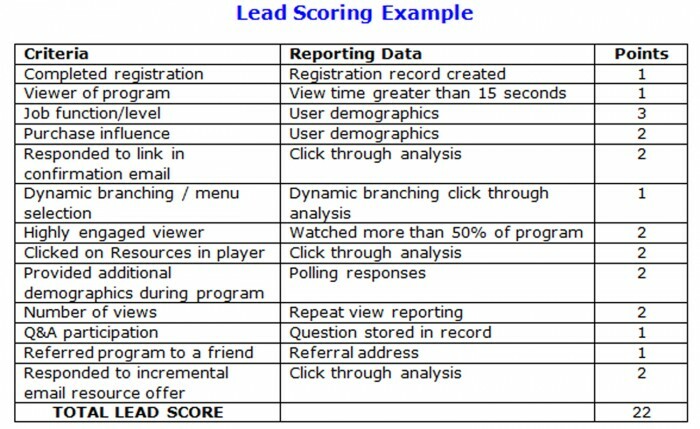 However, you can make your lead scoring system as complicated as you want. As the lead moves down your sales funnel, you will typically assign a higher value to their actions. The purpose of doing all this is to figure out when the lead is going to be most receptive to your pitch. This will take experimentation in your own business to get the timing down, but once you figure it out your sales will skyrocket! "Early Stage: seeking product-market fit. Maturity Stage: focusing on optimization and efficiency." Lead scoring isn't as high of a priority in the early stages of business development. Prioritization of leads isn't as big of a problem at this point because you aren't generating a ton of leads yet. That doesn't mean you shouldn't be tracking your lead activities and gathering as much valuable information as possible, though. That way when you do start optimizing lead scoring, you'll have several months or years of data to help you out. This prevents you from making guesses when you start lead scoring. This is the stage where lead scoring needs to be implemented if you haven't done so already. Once your business is growing and you're generating a lot of inbound leads, you have to identify and prioritize the best prospects from the group. Without lead scoring and lead nurturing, you can't scale your business in its growth phase near as efficiently. Your lead nuturing also has more potential effectiveness because a wider selection of leads allows you to segment your audience and take a more targeted approach. Communication becomes more precise and meaningful. Mature companies have the advantages of more user data and more resources -- they should have robust lead scoring and lead nurturing systems. By this point, your communication is highly segmented and personalized to your various Buyer Personas. There are two major components of lead nurturing: lead scoring and content Marketing. You are most likely already familiar with content Marketing, at least from the perspective of attracting leads. However, we are going to focus on it from a perspective of nurturing those leads. Great content Marketing accomplishes both. The channel where most of the lead nurturing happens is the email list. As we discussed in the section about lead scoring, the lead will be scored based on the form they opted-in at and any demographic information available. From there, the lead is placed into a lead nurturing campaign that's assigned to the form they used to sign-up. This is an auto-responder type of campaign that's already been written and (hopefully) tested for performance, so the entire process is automated. The goal of the lead nurturing campaign is to guide the lead down your Marketing funnel in a way that keeps the lead involved in the process and engaged with your brand. Most lead nurturing campaigns will consist of three to five emails sent over the course of 60 days that will reference the original piece of content that led to the conversion and include calls-to-action along the way that encourage them to convert to another offer. Once the lead converts on a new form or offer, the original campaign will stop and they will be placed in a new lead nurturing campaign -- which again aims to move them even further down the funnel. If your lead nurturing campaign isn't working to its best abilities, you may be missing a key piece that can help your company enhance the quality of your leads as well as pushing those qualified leads that aren't quite sales-ready down the sales funnel. Behavior-based marketing automation enables you to nurture your leads at the right time during the buying cycle. If you send the wrong information too soon you appear sales hungry and if you're too late you can lose your prospects to your competitors. "A single entrepreneur can build trust and maintain authentic conversations with maybe two dozen leads. A small marketing team, with good time management skills, can stay on top of maybe 50. But you need more than 50 leads in your funnel to keep growing. Marketing automation is a technology solution that allows brands to streamline and automate their marketing efforts across various channels, to improve efficiency and drive more sales. Automating a workflow helps align all of your marketing efforts and messages, and makes sure that each lead receives the most relevant messages at the most opportune times." These actions aren't just triggered based on a form fill, they can also be triggered by specific page views, call-to-action clicks, and other conditional rules your company sets up. When a certain behavior or action matches a condition your company set, your lead will be added to a workflow that matches those conditions and the process will begin without you having to do anything. This type of lead nurturing is known as advanced marketing automation. Let's say that someone visited your "about us" page. By using Workflows, you can set up automated emails that are triggered by this action. Upon visiting your "about us" page, your lead will receive a triggered email one day later with an offer like, a "What to Expect When Working With ____" Guide. Three days later, if your lead still hasn't responded to your email, the workflow will send another email that contains blog articles pertaining to other pages that lead visited. If your lead is attracted by your awesome email subject line and opens your email and clicks through your blog articles and stumbles upon a different guide, you can then take the lead off that workflow and put them onto another. It is important to remember that lead nurturing emails get 4-10 times the response rate of standalone email blasts. Just one more incentive to why you shouldn't send every lead in your contact database the same email! It is important to know that its impossible for your lead nurturing campaigns to run effectively if they aren't integrated with other parts of your marketing campaign. Your lead nurturing campaigns should be closely tied with other pieces of your conversion path such as your landing pages, social media, and even email marketing. Don't just send your leads to random landing pages on your site. Take a look at your analytics to determine which landing pages and offers are generating customers for your business. Your top performing landing pages and offers are the ones that you will want to highlight in your lead nurturing emails. Not every offer and landing page is going to be relevant for every lead you have. So, map out your content to set up targeted lead nurturing campaigns that will push your leads through your sales funnel. To integrate social media into your nurturing, consider adding social sharing links and follow links to your email messages. This small little change, can have a huge impact on your reach and click through rate. Social media follow links. By adding social media following links to your site, you are giving your leads another way to interact with you and your company. The more ways your company is able to interact and engage with your company, the more opportunities your company has to educate and nurture your leads. Social media sharing links. With social media sharing links, your leads are able to share your content with their network, exposing your company to new perspective leads and visitors. GetResponse Analysis noted that emails with social sharing buttons had a 115% higher click-through rate than those that didn't. Who wouldn't want to nurture current leads while creating new leads? You can also consider posting links on social media to more bottom-of-the-funnel offers that followers can convert on. "Next time a new lead comes into the system, try connecting with that person on LinkedIn or Twitter. It’s probably best to bypass networks such as Facebook and Instagram in favor of the two former ones, where it’s much more acceptable to reach out to people for business-related purposes." LinkedIn is the best platform for B2B brands, and it's where we often have the most success reaching out to prospects. When you do reach out on LinkedIn, be sure to send a personal invite that uses their first name, explains how you are familiar with them, and offers a brief introduction about yourself. As for Twitter, it's as easy of sending a hello tweet or inquiring how they're enjoying an eBook or free trial. No matter what the platform, just keep the conversation going. The process of lead nurturing sounds complicated, but it's well worth the effort. It will take some time to get everything implemented, but after with some small tweeks to your lead scoring, email copy, and other details until you start getting the conversion rates you want. If you'd rather not mess with this yourself -- let us help.